The following is an article from Uncle John’s Unstoppable Bathroom Reader. What would Porter the Wonder Dog have eaten 200 years ago, before there was Alpo or Dog Chow? Here’s the history of the multi-billion-dollar dog food industry. * More than 2,000 years ago, Roman poet and philosopher Marcus Terentius Varro wrote the first farming manual. In it he advised giving farm dogs barley bread soaked in milk, and bones from dead sheep. * During the Middle Ages, it was common for European royalty to have kennels for their hounds. Kennel cooks would make huge stews, mostly grains and vegetables with some meat or meat byproducts -the hearts, livers, and lungs of various livestock. * Dogs in common households had meager diets. They were fed only what their owners could spare. 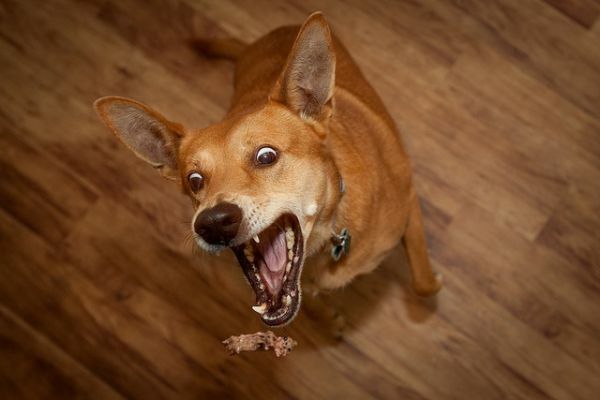 A normal domesticated dog’s diet consisted of crusts of bread, bare bones, potatoes, cabbage, or whatever else they could scrounge on their own. * In the 18th century, farm dogs, which had to be fairly healthy to do their jobs, were regularly fed mixes of grains and lard. In cities, you could make a living by searching the streets for dead horses, cutting them up, and selling the meat to wealthy dog owners. * There were exceptions: The very wealthy, throughout history, have fed their pet dogs fare that was much better than what most humans ate. In the 1800s Empress Tzu Hsi of China was known to feed her Pekingese shark fins, quail breasts, and antelope milk. European nobility fed their dogs roast duck, cakes, candies, and even liquor. The in the mid-1800s, the Industrial Revolution created a growing middle class with more luxury and more leisure time, pets began to be regarded as “luxury items” by everyday folk. Result: pet food became more closely scrutinized. In the late 1850s, a young electrician from Cincinnati named James Spratt went to London to sell lightning rods. When his ship arrived, crew members threw the leftover “ship’s biscuits” onto the dock, where they were devoured by hordes of waiting dogs. That gave Spratt an idea. “Ship’s biscuits,” or hard tack, were the standard fare for sailors for centuries. Flour, water, and salt were mixed into a stiff dough, baked, and left to harden and dry. The biscuits were easily stored and had an extremely long shelf life, which was important in the days before refrigeration. And they looked a lot like today’s dog biscuits. Spratt had the idea that he could make cheap, easy-to-serve biscuits and then sell them to the growing number of urban dog owners. His recipe: a baked mixture of wheat, beet root, and vegetables bound together with beef blood. When Spratt’s Patent Meal Fibrine Dog Cakes came on the market in 1860, the pet food industry was born. 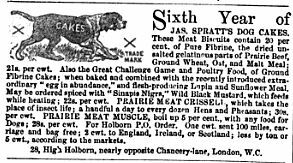 Spratt’s Dog Cakes were a hit in England, so in 1870 he took the business to New York …and began the American pet food industry. 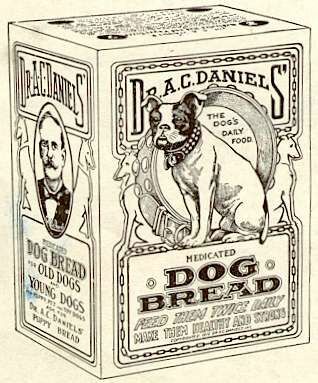 * In the 1880s, a Boston veterinarian introduced A.C. Daniel’s Medicated Dog Bread. * The F.H. Benner Biscuit Company opened in 1908, making biscuits shaped like bones. Bennet also made the first puppy food, and was the first to package different-sized kibble for different breeds. * In 1931 the National Biscuit Company (Nabisco) bought Bennet’s company and renamed the biscuits Milkbones. Then they hired 3,000 salesmen with the specific goal of getting Milkbones into food stores -and the national consciousness. For the first time, dog biscuits became a part of regular grocery shopping. * In 1922 Chappel Brothers of Rockford, Illinois, introduced Ken-L-Ration, the first canned dog food in the United States. It was horse meat. In 1930 they started sponsoring a popular radio show, The Adventures of Rin Tin Tin. Ken-L-Ration became such a success that by the mid-30s they were breeding horses just for dog food and slaughtering 50,000 of them a year. By 1941, canned dog food had a 90% share of the market …until the United States entered World War II and the government started rationing tin and meat. Then dry dog food became popular again. In 1950 the Ralston Purina Company started using a cooking extruder to make their Chex cereal. Here’s how it worked: ingredients were pushed through a tube, cooked under high pressure, and puffed up with air. This allowed Chex to stay crisp when milk was added. At about the same time, manufacturers were getting complaints about the appearance, texture, and digestibility of dry dog food. Purina’s pet food division borrowed an extruder from the cereal division and experimented with it in secret for three years. The result: Purina Dog Chow. 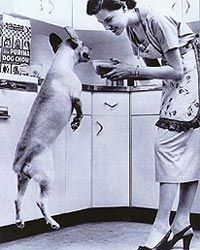 Dogs loved it, it digested well, and it quickly became the number one dog food in the nation -and still is today. In the 1960s and 1970s, factors such as the increased number of breeds and rising crime rates made dog ownership skyrocket. By 1975 there were more than 1,500 dog foods on the market. Today, more than 1,600 square miles of soybeans, 2,1000 square miles of corn, and 1.7 million tons of meat and poultry products are made into pet food every year. There are more than 65 million dogs in the U.S., and pet food as an $11 billion industry …and growing. Copyright @ 2010 - 2018 Black American Bulldogs Bullspirit.